Khitcheri recipe by MuskanKhan85 at PakiRecipes.com. Khitcheri is an easy dish to make. It is nutritious and a complete meal in itself. 1. Put the rice and dal in a sieve and wash it thoroughly under running cold tap until the water runs clear. Soak in plenty of water for about 2 hours. Drain in a sieve and let it stand for a minute or two. 2. 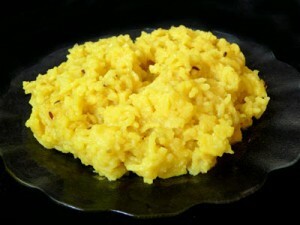 Heat the ghee or oil in the heavy base pan and add the onions, stirring frequently fry to a pale golden color. Add the all spices, fry for 1 minute. Add rice, lentil and salt and level with a spatula. 4. Cover with a tight fitting lid, reduce the heat and allow to cook for about 20 -25 minutes or until rice is very tender and mushy. Transfer it to a serving dish and add butter to it, butter will melt with the heat of the rice. Serve immediately. very good if you are feeling poorly.